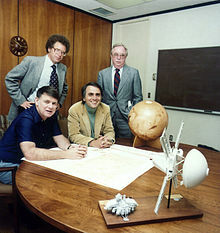 ↑ Spangenburg, Ray; Moser, Diane (2004), Carl Sagan: a biography, Greenwood Publishing Group, p. 107, ISBN 978-0-313-32265-5. ↑ "2013 IRS 990 - Return of Organization Exempt from Income Tax" (PDF). ↑ "The Planetary Society encourages exploration of the universe to find extraterrestrial life", Los Angeles Times, May 1, 1983.